As implied in its title, Bank of America® Travel Rewards credit card is the giant bank’s credit card aimed at customers that like to venture out into the world. It’s a fine travel companion, but also has features even an occasional traveler can take advantage of. No-annual-fee travel cards typically skimp on the sign-up bonus, but this card delivers with its market-leading intro bonus offer (low spending hurdle to qualify), unlimited rewards on spending, and other wallet-friendly perks. Any Bank of America credit card is almost guaranteed to find its way into many thousands of wallets, simply due to the bank’s size and coverage area. So it is with the lender’s namesake card for travelers, Bank of America® Travel Rewards credit card. Although this isn’t a perfect travel rewards card for everyone, it’s very competitive in a crowded field, and has a great deal to like, particularly for its target no-annual-fee audience. Originally, I applied for the Bank of America® Travel Rewards credit card in the hopes that I would be traveling at least occasionally. Although I haven’t jetted around as much as I’d like, I still venture out once in a while. And on those occasions, this card has been a good companion, providing security and peace of mind with its set of travel-related features. Outside of that, I find that a sign-up bonus and a 0% intro APR for purchases are compelling factors in any card. I also find the flat-rate point earnings to be refreshingly straightforward. You can read a little more about all three features in the section below. 25,000 point sign-up bonus -- A sign-up bonus provides a serious head start in the points total. This card sets the bar fairly low, too -- the bonus kicks in after you make at least $1,000 in qualifying purchases on the card within 90 days of the account opening. Worth noting, this is one of the biggest bonuses I've come across in a travel card with no annual fee. Unlimited 1.5 points per $1 -- This card keeps it simple with a what-you-see-is-what-you-get 1.5 points per $1 on all transactions. No annual fee -- The card has many of the perks and features of rival cards that do charge an annual fee. No foreign transaction fees -- Foreign purchases aren’t charged the de facto standard 3% fee many other credit cards do levy. 0% intro APR offer -- The offer includes a 0% intro APR for 12 billing cycles for purchases. A card that gives a customer a break on interest for a full year is always welcome. Gold Preferred Rewards. Points earn a 25% bonus. Platinum Preferred Rewards. Points earn a 50% bonus. Platinum Honors Preferred Rewards. Points earn a 75% bonus. Bonus points for travel spending -- It’s ironic that a card billed as a travel rewards card doesn’t offer bonus points for travel-related purchases, in spite of the other perks for travelers. (The story is different with the Bank of America® Premium Rewards® credit card; see below). Yes, Bank of America® Travel Rewards credit card is a flat-rate card, but there are no-annual-fee cards that feature extra bonus point earning activities. Clumsy points redemption -- My recent experience wasn’t all that smooth; it took some hunting around Bank of America’s site to find the redemption options, and even then it wasn’t 100% clear how to redeem points. Finally, I had to call the bank’s customer service line, which was helpful. I’d much prefer an intuitive online redemption process, though. Since moving back to the U.S. in 2007 from living abroad for nearly 14 years -- and, yes, traveling quite a bit -- I’ve built up a modest collection of credit cards. 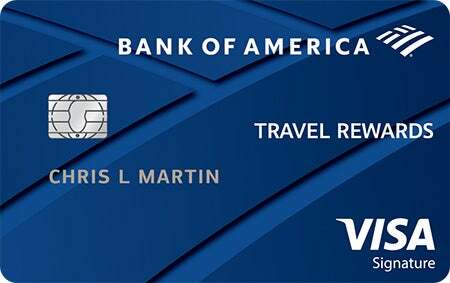 I have used these cards to fund a great many purchases, and have steadily accumulated points/miles/rewards over time. My credit is still in fine shape, and I use the cards judiciously, maximizing my rewards by capitalizing on the particular bonus schemes of each. Recently, I made the first travel rewards redemption on my card. So you can’t beat the timing for this review. Bank of America says that good to excellent credit is required to obtain this card. From what I recall, when I applied I had a score in the 720-730 range. I was given a card with a $5,000 credit limit. In online forums, holders of the card willing to reveal their score generally claimed that it was above 700; several of these people say they were granted a $7,500 credit limit. There are three redemption methods available to you with points earned on this card. The former is better, because you can make your purchase through an online travel agency with its own rewards program and earn points in that program. You can’t earn points like that if you shop for travel through Bank of America. There’s a redemption minimum with this method of 2,500 points, equal to $25 in travel expenses. You can redeem your points for cash back and receive that as an ACH deposit to a Bank of America checking or savings account or to a Merrill Lynch Cash Management Account. Bank of America will also send you a check in the mail for your cash back if you want. This method will get you only $0.006 per point, so it’s not a great choice. This method also has a redemption minimum of 2,500 points, equal to $15 cash back. The Bank of America site has a variety of gift card and gift certificate options available that you can pay for with your points. Retailers all have their own gift card offers, and the value you get for your points will depend on what offers are available and the retailer you choose. You can potentially get $0.01 per point this way depending on the gift card. Your time is probably better spent using your points for travel redemptions, but you may want to check Bank of America’s gift card lineup if those are something that interests you. Something every cardholder should be aware of is the bonuses available if you also have a banking account or investment account with Bank of America. While these don’t change the value of your points, they do help you earn more points on every dollar you spend. The Gold, Platinum, or Platinum honors tier of the Bank of America Preferred Rewards program require you to meet combined balance minimums in any Bank of America, Merrill Lynch, and Merrill Lynch accounts you have. What are Bank of America® Travel Rewards credit card points worth? Points are worth $0.01 per point when you redeem them for travel purchases, which is the best value. Other redemption methods are available, but they won’t earn you as much. At that value, the sign-up bonus is worth $250, because you’ll earn 25,000 points. Since it’s smart to use your points to cover travel purchases, the more purchases that are considered travel, the better it is for you. Bank of America classifies quite a few expense categories as travel, and that makes it easier to use your points. Do Bank of America® Travel Rewards credit card points expire? Your points will never expire as long as your credit card account stays open. 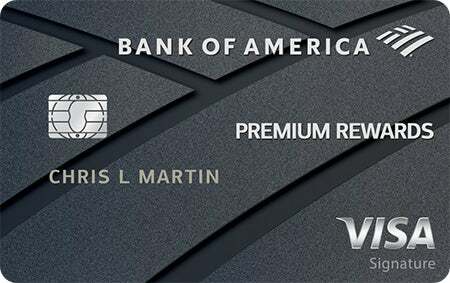 One tier up from this card is the more grandly titled Bank of America® Premium Rewards® credit card. True to its name, the card ups some of the numbers of its sibling, particularly the tally of points earned for travel and dining activities, and intro bonus. Here are the key differences at a glance. Another difference between the two is that cardholders are eligible to receive up to $100 in statement credit every year for spending on supplemental airline services like baggage fees and seat upgrades. Additionally, users can also receive up to $100 in statement credit if they apply for either the TSA Pre✓ or Global Entry programs. On the down side, the card does have a $95 annual fee. The two cards, as they’re from the same issuer, also have much in common. Most enticingly, Bank of America® Premium Rewards® credit card owners can similarly leverage their Preferred Rewards status to pile up the points. Applying the example from the Preferred Rewards blurb in the “What I like about…” section above, let’s say a Bank of America® Premium Rewards® credit card cardholder spends that same $40,000 in one year. He or she splits it between $10,000 in travel and dining purchases, and $30,000 in other commerce. At the Platinum Honors level, they would earn 113,750 points in that year, worth $1,137.50. With its long introductory 0% APR period for purchases, it’s also a good fit for those looking to finance large purchases, and space out payments over time. Bank of America is one of this country’s largest and most sprawling financial institutions, so the application for this card is more or less industry-standard. Bank of America® Travel Rewards credit card is one of the better credit products on the market for frequent travelers, or even occasional vacationers like myself. The intro bonus is also the biggest in the category and it’s also very well suited to existing Bank of America customers, especially if they are enrolled in one of the Preferred Rewards programs. Simply put, you won't find a no-annual-fee travel card that offers such lucrative earnings rate for the highest Preferred Rewards tiers.